CIMRM 695-696 - Phanes and the egg. Modena, Italy. White marble relief (H. 0.71 Br. 0.49). About the discovery of this monument little is known. According to Cavedoni it was "à l'epoque de Muratori (1672-1750) dans le palais du Marquis Sigismund d'Este à San Martino in Rio, terre du duche de Reggio, distante de 8 milles de cette cite" and he adds an hesitating datum about its origin: "Comme ce seigueur de S. Martino possedait d'autres antiquites de Rome, il parait assez vraisemblable que le bas-relief est aussi d'origine romaine". After that it lay forgotten at Modena from 1752 untill it drew Moreni's attention; now Museum Modena No. 2676. Cavedoni, App., 18f; Att. Mem. Mod., I 1863, 1ff; cf. Bortolotti, Spec., 244 No. 246; Venturi, Gall. Mod., 360 fig. 94; Cumont in RA (S.3) XII, 1902, 1ff and Pl. I; RHR CIX, 1934, 65ff; MM Pl. II, 3; RRR III, 61, I; Legge in Proc. Soc. Bibl. Arch. XXXVII, 1915, 155 and Pl. XVIII, 2; Eisler, Weltenmantel, II, 400ff and fig. 47; Boulanger,Orphée, 62 n. 1; Cook, Zeus. II, 105lff and fig. 909; Guthrie, Orpheus, 254; Albizzati in Athenaeum 1937, 193 Pl. 1; Panofsky, Hercules, Tav. V, 8; D. Levi in Hesperia XII, 1944,290 fig. 16; Nilsson in Symb. Oslo XXIV, 1945, 1ff with fig. ; Pettazzoni in AntC. XVIII, i 949, 272 and Pl. IV, 8; Vermaseren, Mithrasdienst, 97ff. See fig. 197, procured by the Keeper of the Museum. In the centre a standing, naked youth, holding a long staff with his left and a thunderbolt with his right. His hoof-shaped feet rest on an upturned cone (half egg) from which flames are pouring forth. Above his curly head with five rays, is a similar cone, turned in the opposite direction and also aflame. Above this fire the head of a serpent, which winds itself round the figure in four spirals. Behind his shoulders with the two wings, the horns of a crescent are visible. On his breast the mask of a lion's head, while from his sides the heads of a ram (r) and a buck (1) are budding forth. The figure is standing in a kind of niche, which is boarded by an elliptical band which is divided into twelve parts. Each part contains a sign of the zodiac. Beginning above the head of the deity to the left viz: Aries-Taurus-of the Gemini, which embrace each other, one holds a lyre-Cancer-Leo-dressed Virgo with cornears in her left-Libra, carried by a standing, naked youth-Scorpio-Sagittarius in the figure of i Centaur, shooting a bow-Capricornus with a fish-tail; Aquarius, a standing, naked youth, emptying an amphora over his l. shoulder-Pisces. P(ecunia) p(osuit) / Felix pater. The name of Euphrosyne has been obliterated as well as possible in accordance with the rule that in the Mithras-cult no women were allowed. Although formerly little attention was paid to the relief, it has been one of the main topics of discussion during the last few decennia. On the ground of an inscription from Rome (No. 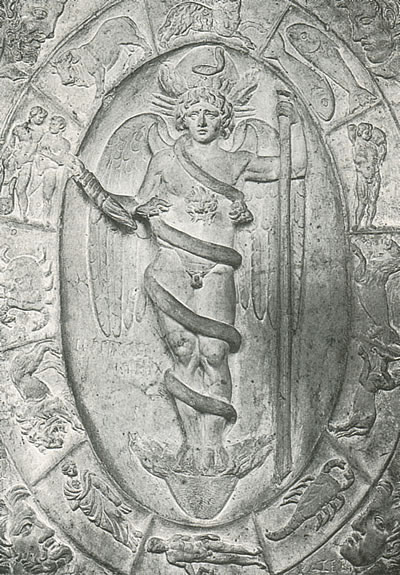 475), Cumont is of the opinion that the youthful-figure must be the god of Eternal Time, identified with the Orphic Phanes. There is of course a chance, that the relief should have belonged to an Orphic sect before it came to be the property of the followers of Mithras. In connection with this suggestion we venture to point to the obliterated name of a woman. 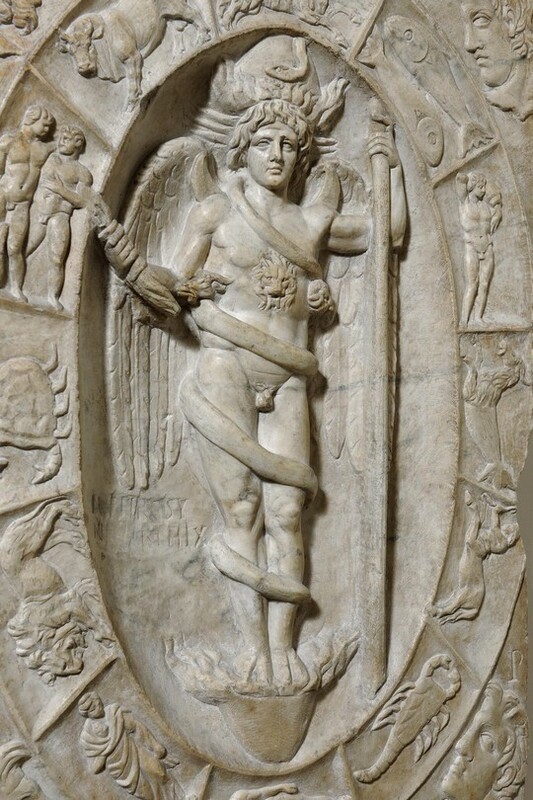 The analogy between the god of Time and Phanes can be accounted for. if one remembers, how Phanes owes his existence to Time. So.it might be a resemblance of father and son. Iconologically important on the other hand is also the Phanes-Pan identification, which here finds its expression in the hoof-shaped feet of the god, whereas moreover the whole shows a close relationship with the-representations of Mithras' rock-birth, the Persian god with whom Phanes had also been identified. So the relief is of a very syncretistic nature. 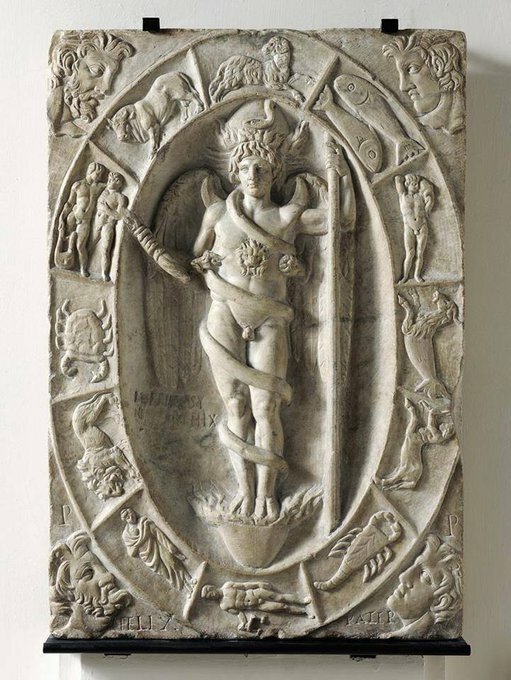 Astrologic, Orphic, Chaldaeic and magic influences are interwoven in this relief, as was shown by Nilsson.